OU Medicine’s Cancer Center in Oklahoma is running “Hair”, a commercial using hair growth as a device to mark the passing of time in a woman’s cancer treatment, beginning in her darkest hour and ending in a more hopeful, brighter time. 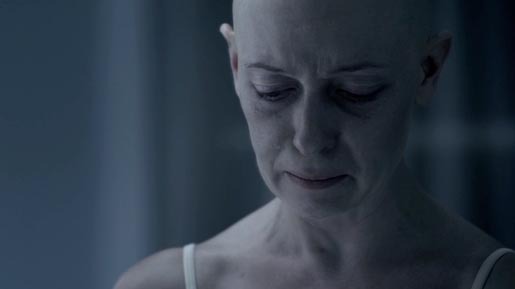 “Hair” opens on our hero in the depths of chemotherapy treatment, evidenced by her bald head and look of utter despair. We see her steeping tea, showering and thinking in her dimly lit home; even the little things are difficult at this stage. As we follow her through different rooms in her house, each location change or action is punctuated by more and more hair atop her head. Finally, as she’s about to exit the home in a now warmly lit foyer, she has a full head of titian hair and her daughter at her side. Mother and daughter then exit into a green and sunny exterior; survivors. The Hair commercial was developed at BVK by executive creative director / art director Rich Kohnke, creative director/copywriter Mike Holicek, creative director/art director Mike Scalise, agency producer Allison Lockwood, account supervisor Tricia Lewis, account manager Ali Dawe. Filming was shot by director Rafael Fernandez via Green Dot Films with director of photography Doug Chamberlain, managing director Rick Fishbein, executive producers Darren Foldes and Rich Pring, and producer Jacquie Frisco.